Sonos’ newest smart, compact soundbar has room-filling sound and is packed with features, including dialog clarity speech enhancement, Amazon Alexa voice control and more. 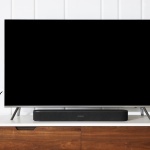 Less than 26 inches long and only a few inches tall, the Sonos Beam is 60% of the size of the Sonos PlayBar but offers the same powerful sound. Fitted securely in the custom-designed wall mount or sitting comfortably in front of your TV, this unobtrusive soundbar is perfect for rooms where space is a premium. • Voice control – Far-field microphones detect your voice from any direction, anywhere in the room. You can speak at natural volume to activate Alexa-supported voice commands. • Certified partnerships with smart home systems like Wink and Lutron. Command your entire house with your voice. While Sonos Beam is a great soundbar on its own, it also wirelessly pairs with the Sub for added bass and a pair of Sonos speakers for full surround sound. A setup with left and right rears and a Sub gives you true 5.1 surround sound or easily connect Sonos speakers in different rooms over WiFi to create a home sound system that brings every room and everyone together.